Summer seems to bring out the kid in all of us. And this summer is certainly no exception. So, what goodies are bringing us back to the good ‘ole days? ADULT POPSICLES —specifically the kind that we can make ourselves. While we happily promote healthy options on the regular, it gets pretty hard to resist “adulting” popsicles up a bit on a hot summer day. What’s better than a frozen treat loaded with booze to give you life? 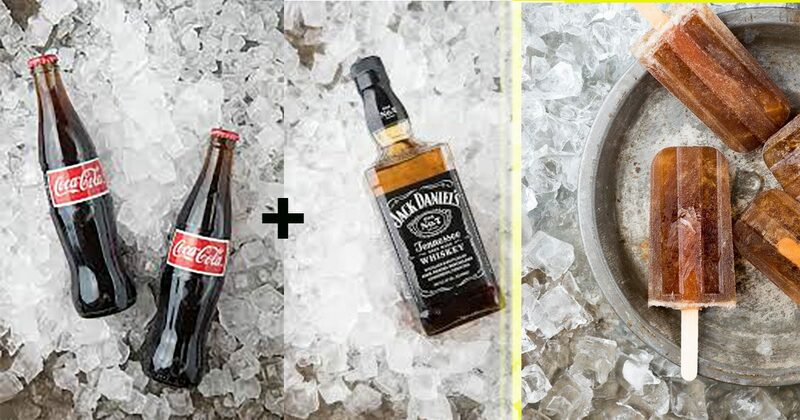 Today’s recipe includes two of our favorite treats — Jack Daniel’s and Coca-Cola. First things first, you’re going to need popsicle molds and wooden sticks if your molds don’t include a top. A quick search on Amazon brings up all the molds your popsicle-loving heart desires. Today’s classic (and simple) recipe comes from Boulder Locavore and is just the right amount of wrong for those of you looking to have a good time. All you need is Jack Daniels Whiskey and some classic (or Mexican) Coca-Cola. Whichever you choose, be sure the Coke is flat by pouring it into a bowl and letting it sit until the carbonation is gone. Pour 1/2 ounce of Jack Daniels and 2 ounces of the flattened Coke into the mold and stir. Cover and insert wooden sticks (or the stick on your popsicle molds). If your molds do not have a cover, try using foil as a top layer to keep the sticks in place. Freeze as long as is needed (usually just a few hours). If the popsicles stick, run some hot water on the outside of the mold to get them to pop right out. If Whiskey isn’t your jam, no problem! How about vodka and gummy bears? Or spiced rum? What about something even lighter, like champagne and fruit? Get creative with it and make your own recipes! If you found this recipe helpful and delicious, please share with friends and family by clicking the button below!